Birthing live young, as opposed to laying eggs, seems to fall almost completely in the domain of mammals. With only two exceptions, the echidna and the platypus, all mammals deliver live births. Reptiles, on the other hand, generally lay eggs to hatch their young. Like the two rare mammals that lay eggs, this trend is broken for reptiles by a few species that give live birth to their young. While many reptiles lay eggs (oviparity), certain kinds of snakes and lizards give birth to live young: either directly (viviparity) or via internal eggs (ovoviviparity). Every species of boa gives birth to live young. 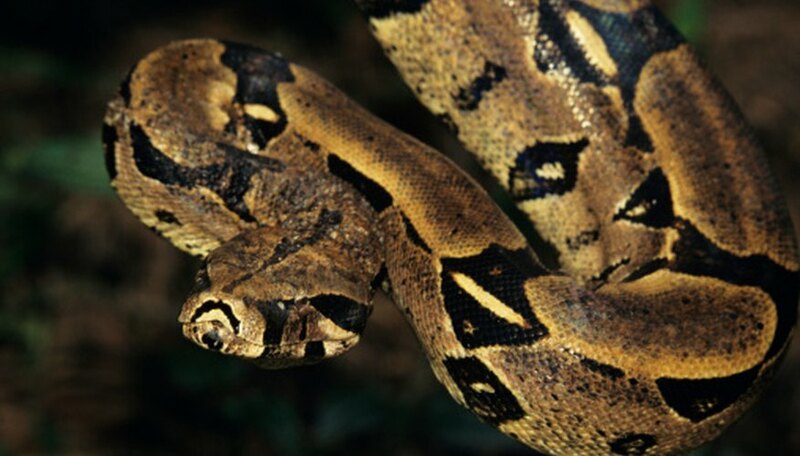 Boas include some of the largest snake species in the world and are most prevalent in tropical and subtropical regions, although some temperate representatives exist. Boas, which lack venom, are constricting snakes: They ambush their victims and coiling around their bodies, the prey ultimately dying of suffocation. Vipers are heavy bodied poisonous snakes with fangs that fold back into the mouth until ready to strike. Most of these widespread snakes – found in the Americas, Eurasia and Africa – give birth to live young. Well known examples of vipers include the asps and adders of the Old World and the rattlesnakes of the Western Hemisphere. Garter snakes are among the most common and widespread snakes in North America, the only continent where they're found. All garter snakes are ovoviviparous, which means the embryos develop inside eggs that are retained within the mother's body until ready to hatch, with young thus born live. Often thought of as non-venomous, garter snakes do technically possess a neurotoxin, but the venom is too weak to cause any damage to humans. The small lizards called skinks can be found all over the world in the form of hundreds of different species. Three species of skinks give birth to live young: Solomon Island skinks, blue-tongue skinks and shingleback skinks. Solomon island skinks, which boast a prehensile tail, are found in Papua New Guinea and the Solomon Islands. Blue-tongue skinks are found in Australia, Tasmania and New Guinea and are named for their dark blue tongue. The shingleback skink, meanwhile, inhabits southern and western Australia. The Jackson’s chameleon is a true chameleon that is native to Kenya. Besides the male's three prehistoric-looking forehead horns, the species is known for giving birth to live young, unlike most chameleons. The Jackson’s chameleon has the unusual ability to focus its eyes in two different directions at the same time, its brain evolved to process the two visual signals separately. Rubino, C.A.. "Which Reptiles Do Not Lay Eggs?" Sciencing, https://sciencing.com/reptiles-do-not-lay-eggs-8098963.html. 30 April 2018.